Monisha Dhamodaran holds a postgraduate diploma in art and design from Srishti Institute of Art, Design and Technology, Bangalore. She aligns her personal interest in Indian art practices to her research. The rich art of Bidar, bidri, is a legacy that has been carried forward for more than 400 years. With each passing year, bidri has undergone several changes at all levels of production. While some of the craft traditions have undergone massive change, or over a period, been erased from history due to their decline in demand, increase in cost of production, time-intensive nature of processes, an increase in the cost of raw materials, reduction in number of skilled artisans, and so on, bidri continues to survive in this day and era. Today, Bidri is produced only in two centres in India: Bidar and Hyderabad. 1. Teh nashin refers to ‘thick inlay of gold or silver in deep engravings on a baser metal surface’ (Sen 1983:37). This is most common in early bidri and is still in practice. The designs are done in silver against a black background. The designs are flushed with the surface of the metal without any relief. 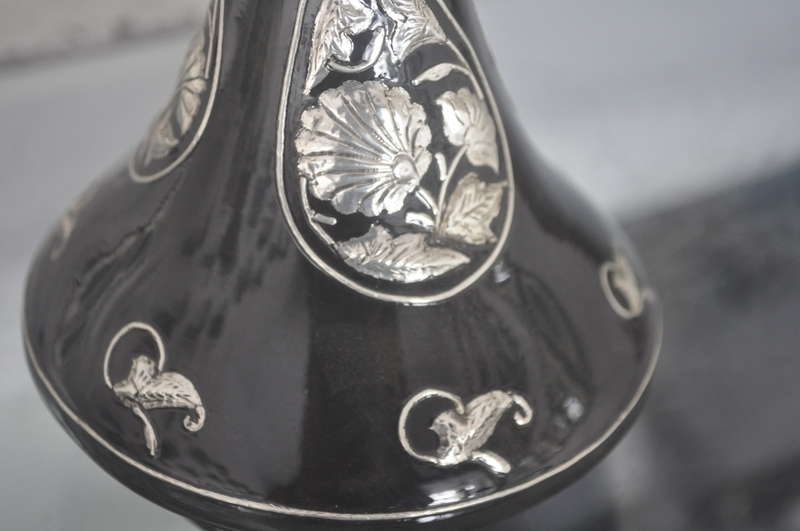 The required floral pattern is engraved on the surface of the metalware and then inlaid with silver. 2. 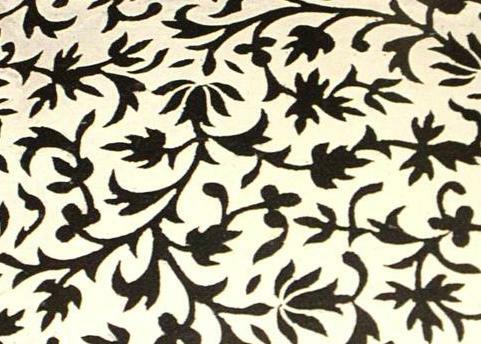 Aftabi, also known as mehatabi, refers to silver inlay on the background while the designs appear to be in black. This work requires high skilled labour and is extremely time-consuming. The required designs are first drawn on to the surface of the object and the remaining background is engraved leaving aside the design, on which silver is further inlaid. Aftabi designs use silver sheets instead of silver wires as silver sheets help cover larger spaces on the background compared to silver wires. Teh nashin and aftabi are the exact opposite of each other. 3. Tarkashi is nothing but plain wire work. Grooves for the required design are made on the surface of the object. Silver wire of required thickness as per the grooves designed are made and then inlaid onto the balck surface. In early bidris, this inlay most often has been seen along with sheet work. Star work, commonly known as phooljhadi work, is also an example of tarkashi. 4. Zar buland or Zar nashin refers to inlay with high or low relief. In bidri it is done using a ‘zar buland' where silver is inlaid over a lead pad so that the pattern stands up from the surface (Stronge 1985:11). Zar buland or zar nashin are often referred to as the same kind of work yet have a minute difference between them. Zar buland is slightly higher relief than zar nashin, which is lower relief than zar buland (Sen 1983:37). Bidar being the epicentre for the production of bidri, the art travelled places and was produced, historically, not only in the Deccan but in various parts of the country, namely Purnea, Murshidabad, Moradabad, Delhi, Jaipur, Faizabad, Benaras, Calcutta, Zawar, Surat, Bombay, Ahmednagar, Golconda, Bijapur, Hyderabad and Lucknow, under the Mughals and Nawabs during 1707 AD (Patel 2015:7). Most places developed their unique style of bidri work. While Lucknow, Purnea and Murshidabad had their own style of work, Bidri from Purnea could be further classified into two types—Gharkhi bidri and Karana bidri, the first being a superior category and the latter being an inferior category of Purnea bidri. Similarly, there is a visible difference between the Deccani style of designs in bidri versus the Mughal styles. The Deccani style designs are flowy compared to the Mughal designs, that are rigid and repetitive, says Jagdish Mittal during a personal interview. Zar buland or zar nashin are mostly preferred bidri style in Lucknow. Apart from these specific kinds of bidri, there are other styles as well, such as the ‘Ganga–Yamuna kaam’ mentioned by Baapu Nagesh, a 76 year-old bidri artisan, during an interview; but such styles seems to have disappeared over time. Surjit Narayan Sen (1983:36) first mentions the Ganga Yamuna pattern and describes it as ‘a pattern of gold and silver designs running side by side in Indian metal craft’. The use of two metals, gold and silver respectively, in bidri designs can been seen on articles dated before the 18th century. Bidris were owned mostly by royalties like the kings and the zamindars, often used as utility objects, as a display of one’s wealth. This pattern, unlike the regular, had to be done with utmost care and attention. After the required design is engraved, the process continues wherein only silver is inlaid while the grooves for gold are left empty. And after the final colouring of the article, gold is inlaid. This is because gold is a softer metal and it tends to fall out during the process of buffing and polishing. In a conversation, Maruthi Rao, a 59 year-old bidri artist, said that the motifs in the Ganga-Yamuna are always alternatively gold and silver. Sayed Rafiudeen, a 69-year-old bidri artisan had also mentioned gold sheets being predominantly used during this process. This was done in order to use a minimal quantity of gold and yet cover a greater surface area on the article. Gold wires in comparison to gold sheets were expensive as wires were heavier than sheets, and hence sheets were prefered to gold wires. Bidar today has only a handful of artisans who know about the Ganga-Yamuna pattern. Regarding the disapperance of this type of bidri work, most artisans, who even knew about it, had a similar response as Sayed Rafiudeen, ‘Pehele hota tha, hum bhi kiye hain, tab kya tha sona jo hai chaalis–pachaas rupay tola hoti thi, aur chaandi jo hai do rupay ek tola hoti thi,' that is, gold was Rs 40-50 and and silver Rs 2 for a tola (12 grams); gold, today, is approximately valued at Rs 3,000 per gram and silver at Rs 40 per gram, thus increasing the raw material price manifold. This has has been the primary reason for the decline of the Ganga-Yamuna style of bidri work. The result of this faded memory of the Ganga-Yamuna pattern is seen in most of today's bidri artists. The pattern's true meaning of using two specified metals—gold and silver, today translates to the use of any two or more metals for inlay. The commonly used metals for the pattern today are silver, copper, and brass. All other metals except gold are treated like silver. Copper and brass are inlaid as and when silver is being used, hence the steps are shuffled. Mohammed Usmaan, a 65 year-old senior bidri artisan who lives in the Bidri Colony, mentioned a style called munauwatkari kaam, which is actually nothing but the zar buland or zar nashin type. Zar buland and zar nashin are unfamiliar names to most bidri craftsmen nowadays and hence munauwatkari emerges as a colloquial name. 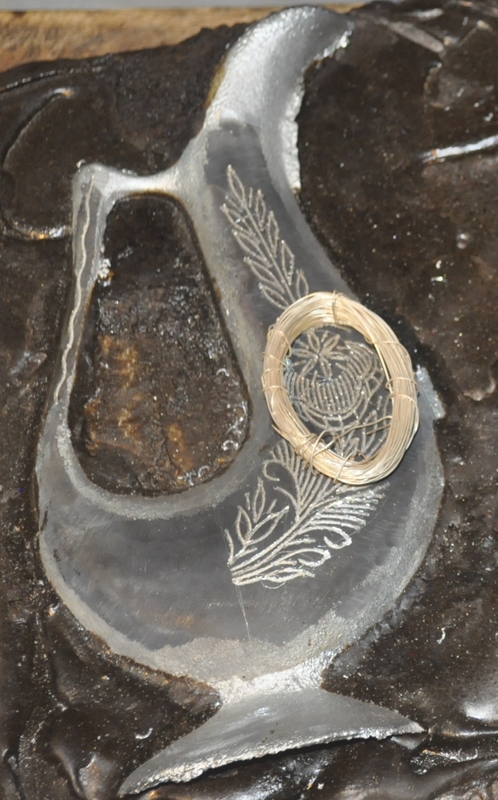 Zar buland, as mentioned earlier, is lead-based silver inlay. During this process, once the moulding and designing is done, deep grooves are made for the motifs onto which lead, which is a soft metal that can be moulded easily and can be cut as per the size of the groove, is fitted inside the groove by slightly beating with a hammer. Small dots and lines and made on the lead pad on which a silver sheet is then traced neatly as per the design, the extra sheet is then cut with a chisel. The silver sheet is similarly beaten with a hammer for it to fit onto the lead pad and the sides are neatly outlined with a chisel, hammering the silver in a way it doesn't fall out. In the following process, either silver or gold sheets are used or thick silver wires are used in order to raise the designed surface higher against the black surface. The chisels used for munauwatkari are different than that of the ones used regularly. Two very specific chisels used are the U-shaped chisel and a flat-headed chisel. Most bidri work artefacts recovered from Purnea and Lucknow in the 18th and early 19th century are fine examples of zar buland. ‘In bidri, or any metalware, the technique decides the design,’ says Jagdish Mittal. He further adds, ‘The technique will not allow that sort of fine work, it has to be bold. That's the main thing and with that sort of technique when relief is there, the design has to be more simple.’ Hence most bidris with zar buland or zar nashin have comparatively less intricate work as seen in other techniques used in bidri. Bidris of the munauwatkari kind are no longer found in the market, reasons for which could possibly be the metalwork going out of fashion or, more importantly, the lack of informed artisans as also artisans who are experts at producing munauwatkari bidri artefacts but do not practice/produce it anymore. Again, senior artisans who have worked on it, or have seen the work being done, vaguely remember the process of it being made. The only artefact of this kind seen during this study was in Hyderabad. It was interesting to see how the seller had a munauwatkari metalware to just add variety but had no knowledge of the work it entailed. Further, the finishing on the product was not the black colour obtained by the soil from the Bidar Fort, but was more likely painted black (Fig 4). Another type of bidri work is pardashkari kaam. According to Mohammed Rauf, a 60-year-old senior bidri craftsman and a National and Shilp Guru awardee, it seems to have come into the market during the late 19th and 20th centuries. Pardashkari is an extra fine line of detailing which is done on top of the silver designs after the article is completed. This was done in order to give the artefact a shine, making it more visually appealing for a customer to buy. It had demand in the market and was valued more than regular bidri as it took more time and effort to do the extra layer of delicate engraving on the existing silver inlay. This style of bidri died out over a period of time. While most of the artisans remember pardashkari style of bidri work, Shah Rasheed Ahmed Quadri, 63 year-old senior bidri artisan who too is a National, State and Shilp Guru Awardee, says people have, over a period of time changed its name. He further mentions the actual name as prakashkari kaam. He splits the word into two and says it was called prakashkari as prakash means light. This particular work gave shine to regular bidri and hence it was named prakashkari and not pardashkari but people over time have changed its name to pardashkari. Mittal, Jagdish. 2011. Bidriware and Damascene Work. Hyderabad: Jagdish and Kamala Mittal Museum of Indian Art. Patel, Rehman. 2015. 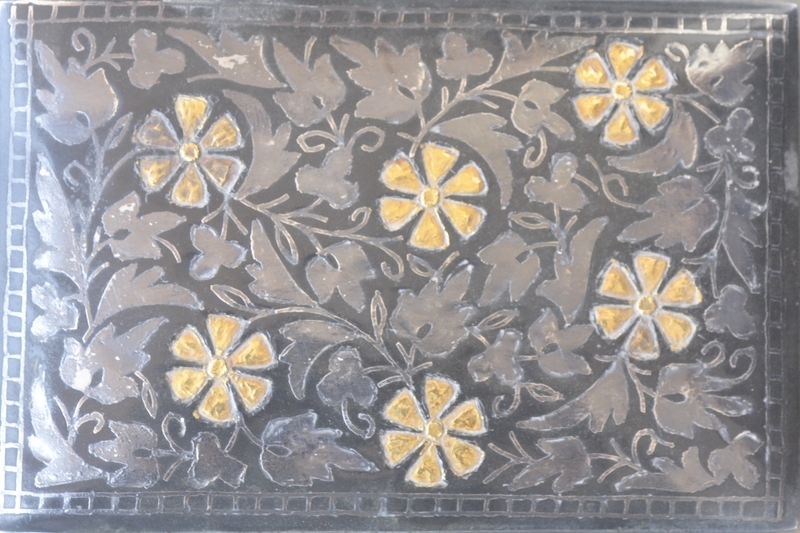 Bidri Art—Inlaid Metal work from Bahmani Sultanate. Bidar: District Administration. Sen, Sujit Narayan. 1983. Catalogue on Damascene and Bidri Art. Kolkata: Indian Museum. Stronge, Susan. 1985. 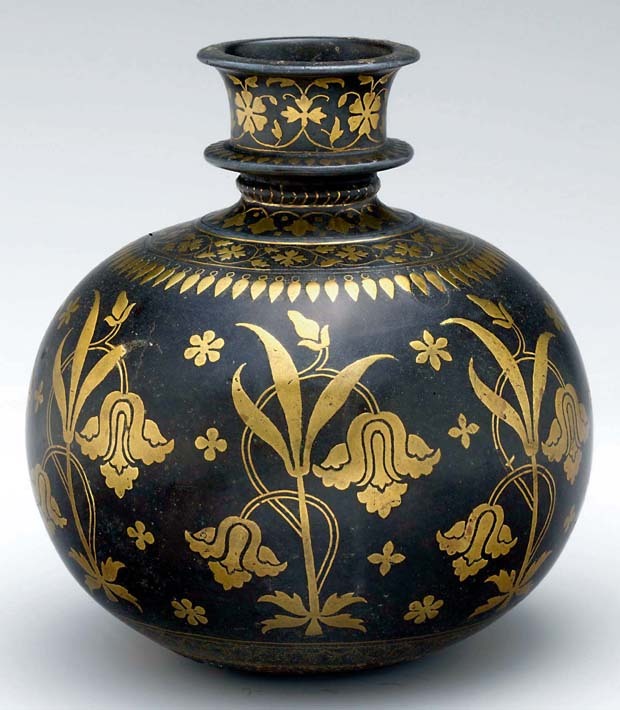 Bidriware: Inlaid metalwork from India. London: Victoria & Albert Museum.